While shorthanded, Bryan Little chipped the puck to Kyle Connor just outside the Jets blueline. Connor broke in all alone and went backhand to forehand before lifting the puck over the leg of Marc-Andre Fleury and in. Mathieu Perreault chipped the puck behind Derek Engelland just inside the Vegas blueline, broken alone, and lifted a backhand over the glove of Fleury and in. Paul Stastny bounced a pass off the board to Brayden McNabb, who fired a slap shot from the left point that was redirected by Brandon Pirri over the glove of Laurent Brossoit and in. 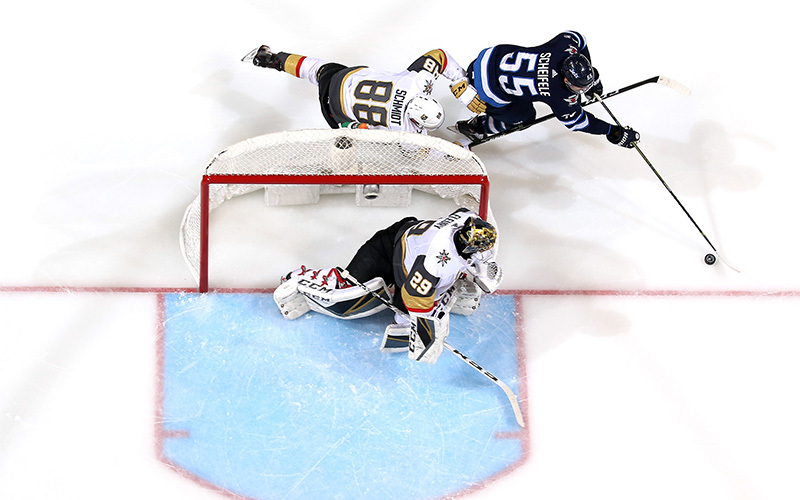 With the Vegas net empty, Blake Wheeler blocked a shot, then knocked the puck to Mark Scheifele on the right wall. Scheifele skated to the red line before passing across to Kyle Connor who moved in alone and fired it into the open net. With the Vegas net empty, Blake Wheeler passed to Kyle Connor, who found Mark Scheifele at the redline. Scheifele moved to the Vegas blueline and sent a wrist shot into the open net. Improve to 30-14-2 on the season and 18-6-2 at Bell MTS Place. Improves to 8-0-0 when giving up 40-or-more shots in a game this season. Improve to 16-3-2 when tied after the first period this season. Improve to 17-7-2 when being outshot this season. Allowed a season-high 26 shots in the second period, which is a franchise record for most shots allowed in a period. Penalty kill went a perfect 6-for-6 on the night. Scored their sixth shorthanded goal of the season, tying them with four other teams for third in the NHL. Winnipeg has three shorthanded goals in their last six games. Made a season-high 43 saves tonight, which his sixth consecutive start of making 30 or more saves. Made 26 saves in the second period to set a franchise record for most saves in a period. Won his seventh consecutive game, and 10th game of the season overall, improving to 10-1-1. Scored his first career shorthanded goal in the second period. Scored twice on three shots tonight and now has five goals on nine shots in four career regular season games against Vegas. Finished the night with three points (2G, 1A). It’s his second three-point game in his last three games, and his eighth multi-point game of the season. Played in his 800th career game tonight. Assisted Kyle Connor’s second period goal to extend his point streak to six games (4G, 4A). Had two points (1G, 1A), extending his point streak to six games (3G, 6A). Registered his 50th assist of the season on Kyle Connor’s third period goal. It’s the second consecutive 50-assist season for Wheeler, and third time in the last four seasons. Finished the night with two assists, extending his point streak to three games (2G, 3A). Led the Jets with five hits tonight. Scored his 10th goal of the season. It’s the third consecutive season Perreault has scored 10-or-more goals, and sixth time in his 10-year career.